Ever since she was born, Riley has been the type of child who wants to be where the action is. She loves people and going any place with her is always an adventure! Since traveling in a stroller can be a limiting experience at times, I love being able to wear Riley on my back. When she was a baby, I often wore her on my front so that she could be close to me and still allow me the freedom to take care of household chores like vacuuming, doing dishes and washing clothes. Unfortunately, the baby carrier I had was of a very poor quality and it often caused me a ton of pain! As Riley kept growing, I knew that I could no longer wear her any longer. Fortunately, I had the opportunity to review the Boba Organic 2G Child Carrier which claims to accommodate a child that weighs up to 45 pounds! If this were true, her father and I could start strapping Riley to us again and be free to take her off the beaten path. Keep reading to find out my experiences with this child carrier. 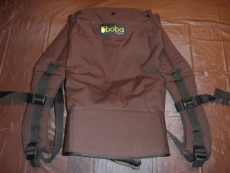 I reviewed the Boba Organic 2G Child Carrier in Walnut from NAP, Inc., which retails for $118.00. Since I definitely miss carrying Riley around with me, I was very excited to receive the Boba Organic 2G Child Carrier in Walnut! The first thing that impressed me when I took the Boba out of its package had to be how soft the material was as well as how padded the straps were! The Boba Organic 2G is made from GOTS and OE100 certified 100% organic cotton and organic Texas cotton lining, so no wonder this item felt so nice. Of course, I am always concerned with Riley's comfort and I know she'll enjoy riding along in this carrier. The last child carrier I had consisted of a nylon/polyester material which I'm sure felt very rough against her delicate skin. As you can see from the picture above, the Boba is perfect for carrying babies in the front and you can also carry larger children in the back. It is a one-size fits most, so that both mommy and daddy can easily use the same carrier. The next thing that I loved about the Boba Organic 2G had to be how comfortable it was to wear. If you look at the left picture above, you can see the high density waist and shoulder strap foam used as well as the durable and sturdy black straps which adjust easily. 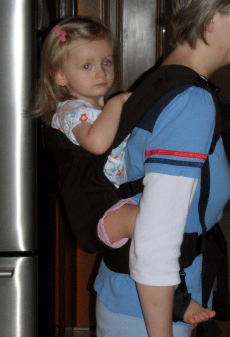 The black straps ensure that your child is safe and secure while traveling. The Boba Organic 2G even has removable foot straps which ensure that your child doesn't experience any discomfort in their leg/hip area. Riley's feet fit nicely in the stirrups and I only had to adjust her feet once or twice while we were walking around the neighborhood. Older children will also appreciate the extra high back of the Boba Organic 2G, which makes sure that they receive the extra support needed for their little backs. Another unique feature of the Boba Organic 2G is a removable sleeping hood for small babies who are just so comfortable being next to mommy that they want to take a quick snooze! Now the extra noise and light can be blocked out so that baby can nap in utter comfort. The only part that I found difficult with using the Boba Organic 2G Child Carrier was getting Riley in the carrier and ready to go. I tried following the directions on the packaging, but found that I needed my husband's help to get her in and secure. 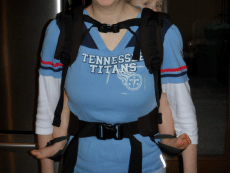 Once Riley was in, the Boba carrier was super easy to adjust for my body. 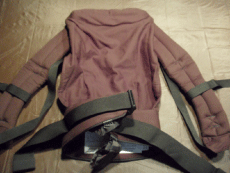 The shoulder straps were designed so that they could just be pulled with one hand to make them tighter. Even though Riley weighs close to 30 pounds, it was very comfortable carrying her around the neighborhood on our family's evening walk. I am very grateful to now have the option to carry Riley again! I just wish I would have found out about the Boba Organic 2G Child Carrier sooner so that I could have carried her all along! 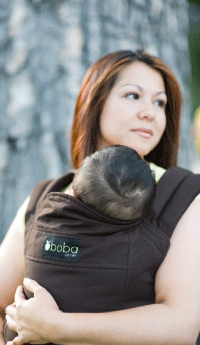 Disclosure: I received the Boba Organic 2G Child Carrier in Walnut from NAP, Inc. in order to facilitate my review. No other compensation was received. This product review is based on my own personal experiences with this item and is completely honest and objective.